This book takes UX acceptance as a point of departure, and builds on it with actionable steps and case studies to develop a complete strategy, from the big picture of product design, development and commercialization, to how UX can help create stronger products. This is a must-have book for your complete UX library. User experience professionals working with product development engineers and teams, as well as graduate researchers in the field. 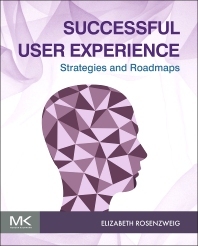 Chapter 1: What is User Experience? How Does Design Affect a Person? Elizabeth has worked as a consultant and employee in several major corporations for over 28 years. Her experience includes design and development, ranging from website and, applications, to hardware products and technology development. Elizabeth has completed projects for many major corporations as well as academic institutions. Elizabeth holds a BA in Fine Art Photography and Printing Technologies from Goddard College and a MS in Visual Studies (User Interface Design and Computer Output) from the Media Lab at MIT. Principal Consultant, User Experience Center, and Adjunct Faculty, Human Factors and Information Design, Bentley University, USA.